Title NoteTitle based on provenance of collection. Administrative/Biographical HistoryHilary and Harrison Brown met in Germany in the early 1930s. They moved to Canada in 1937, and lived on Hornby Island in British Columbia. Scope & ContentCollection consists of Holocaust-related material collected by Harrison and Hilary Brown. Records include booklets, pamphlets, propagada, news clippings, articles and reports by Harrison Brown, a scrapbook containing notices of his speaking tours and private correspondence, in German with translations by Hilary Brown. Collection has been arranged into the following eight series: Pamphlets (1933–1951); Friends of Europe: Monthly survey of German publications (1934); Official Nazi material on women (1935–1946); Articles by Harrison Brown (1932–1943); Newspaper clippings (1933–1960); Personal correspondence (1932–1933); Early Nazi propaganda (1932–1936; 1998); Scrap Book (1934). Immediate Source of Acquisition or TransferRecords were in the custody of Hilary Brown prior to their donation to the VHEC in 1998. System of ArrangementCollection was arranged in 1998 according to classifications established by the creator. 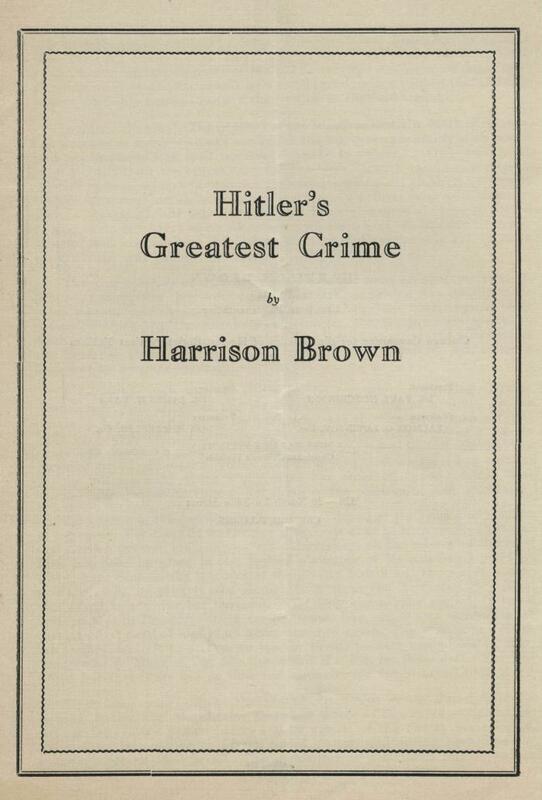 Collection consists of Holocaust-related material collected by Harrison and Hilary Brown. Records include booklets, pamphlets, propagada, news clippings, articles and reports by Harrison Brown, a scrapbook containing notices of his speaking tours and private correspondence, in German with translations by Hilary Brown. Collection has been arranged into the following eight series: Pamphlets (1933–1951); Friends of Europe: Monthly survey of German publications (1934); Official Nazi material on women (1935–1946); Articles by Harrison Brown (1932–1943); Newspaper clippings (1933–1960); Personal correspondence (1932–1933); Early Nazi propaganda (1932–1936; 1998); Scrap Book (1934).